New Hope for American Art is the most comprehensive book ever published on artists from, and surrounding, the New Hope Art Colony (also known as the Pennsylvania Impressionists). This book, with its 612 pages and over 1,000 color plates of artwork include biographies of 165 individual Pennsylvania Impressionists and New Hope Modernists as well as artists from the Philadelphia Ten, a pioneering group of women all educated at Philadelphia art schools. New Hope for American Art also includes important information on art collecting, values and opportunities in art as well as helpful charts showing appreciation and past performance at auction by these famous artists...all invaluable tools to help train the collector's eye. 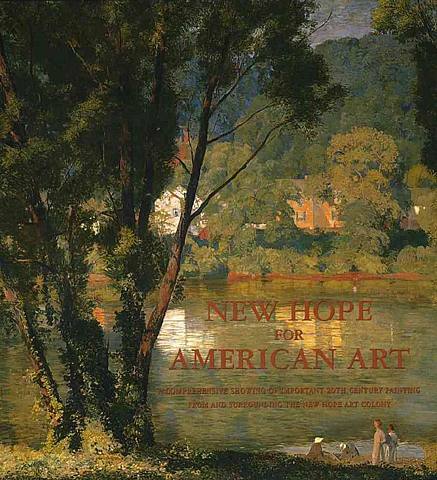 New Hope for American Art was authored, designed and published by James M. Alterman, an expert in the field of Pennsylvania Impressionist and Modernist painting. A longtime collector and owner of two fine art galleries, Alterman wanted to create a user-friendly book intended not only to educate collectors and enthusiasts about this art but to help train one's eye. The book offers valuable tips on how to avoid common mistakes often experienced by new collectors drawn from the author's personal experiences as a collector and fine art dealer. "He [Jim Alterman] published the gold standard volume on the subject, a comprehensive tome titled New Hope for American Art overseeing every detail of production, particularly the veracity of color reproduction." Heavily weighted with 11 Ibs. of illustrations showing fine examples from over 50 private, corporate and museum collections, New Hope for American Art is no doubt a feast for the collector's and novice's eyes. "Alexander Farnham: Brought to Light"
"An American Tradition: The Pennsylvania Impressionists"
"Anthony Michael Autorino: !Y NOT"
"Anthony Michael Autorino: Easy on the Eyes"
"Anthony Michael Autorino: No Bull!" "Anthony Michael Autorino: Stayin' Alive"
"Charles F. Ramsey: Father of New Hope Modernism"
"Charles Sheeler in Doylestown: American Modernism & the Pennsylvania Tradition"
"Daniel Garber: His Life and Work"
"Form Radiating Life: The Paintings of Charles Rosen"